KA 21 is hardware solution for Gayle PCMCIA reset bug. 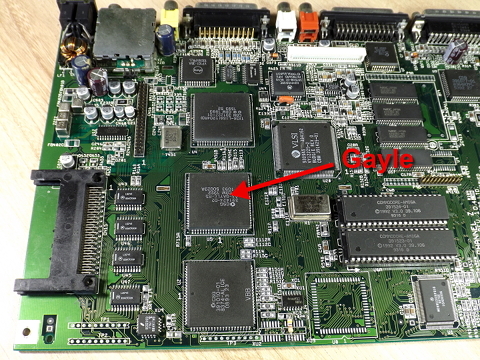 The Gayle chip in Amiga 1200 does not reset PCMCIA card during system reset event (for example keyboard reset). Then some cards are not working after such event until the Amiga is powercycled. 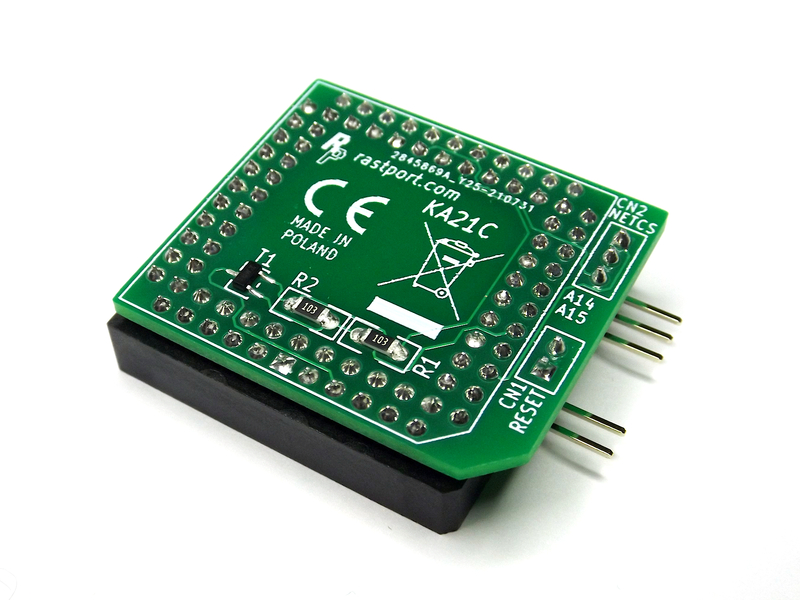 KA 21 generates forced CC_RESET high pulse from system reset signal. The device is installed directly on the Gayle chip. KA21 cannot be used together with Elbox FastATA. 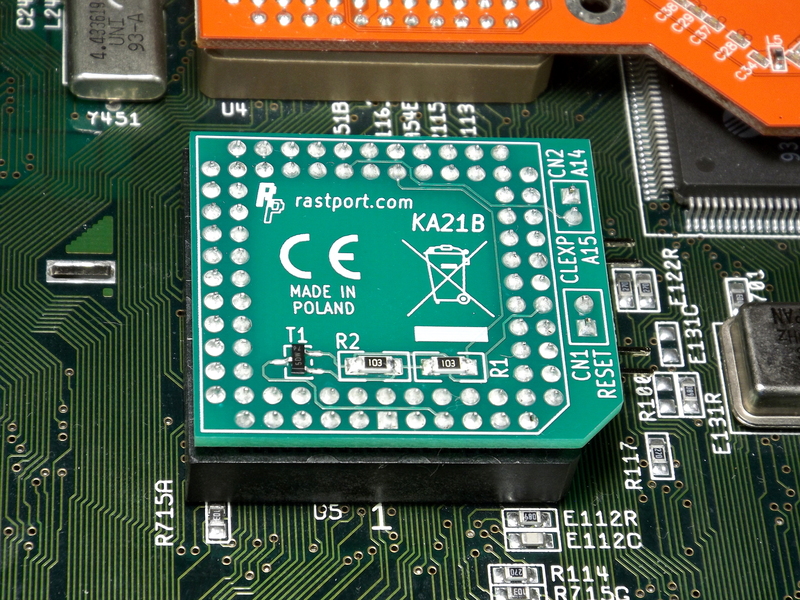 The reason is FastATA has its own board mounted on Gayle chip. Installation of this unit requires partial disassembling of the Amiga including mainboard removal. Some skill and set of tools are required. 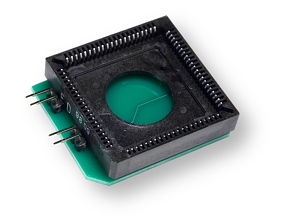 Amiga is a complex electronic device susceptible to ESD (electrostatic discharge). Use of antistatic bench mat and wirst strap is recommended. Step 1: Remove the mainboard from the case. Yes, it is a lot of work, but don't take a shortcut by installing KA21 to mainboard mounted in the case. 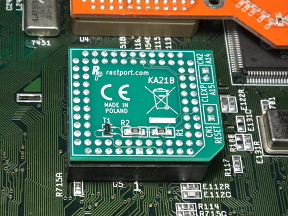 It seems to be possible, but then pushing PLCC socket of KA21 onto the Gayle chip bends the mainboard. It stresses solder joints and tracks on the mainboard. Step 2: Locate the Gayle chip (see the photo). Check that its pins are clean and not deformed. Note that if something has been soldered to Gayle pins, or Gayle has been replaced in the past, installing KA21 may be not possible. 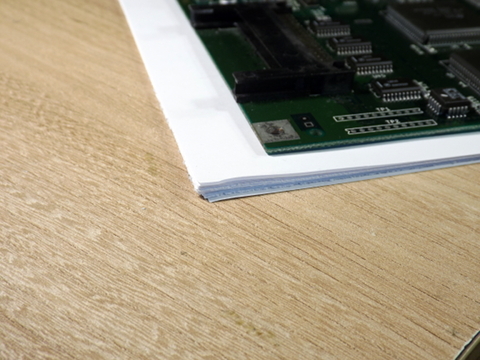 Step 3: Put the mainboard on ESD mat (the best), stack of paper, a newspaper or cardboard, to give even support under the Gayle chip. Do not use plastic materials like foam or bubble wrap, as they easily generate electrostatic charge. 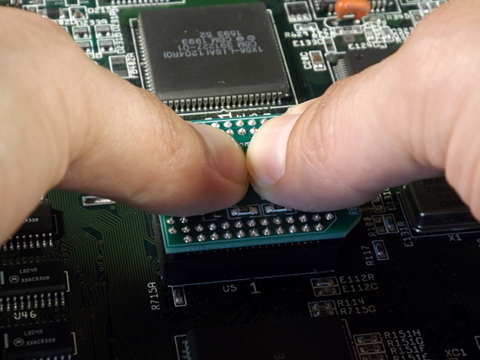 Step 4: Carefully put KA21 on the Gayle chip, without pressing yet. Observe KA21 orientation, as shown on the photo. Make sure that PLCC socket on the KA21 engaged a bit with Gayle, so KA21 cannot be moved horizontally in any direction. 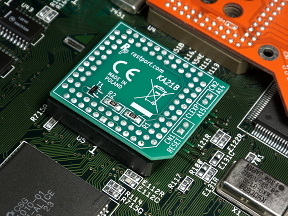 At this stage gap between the socket and the mainboard is about 2.0 mm. 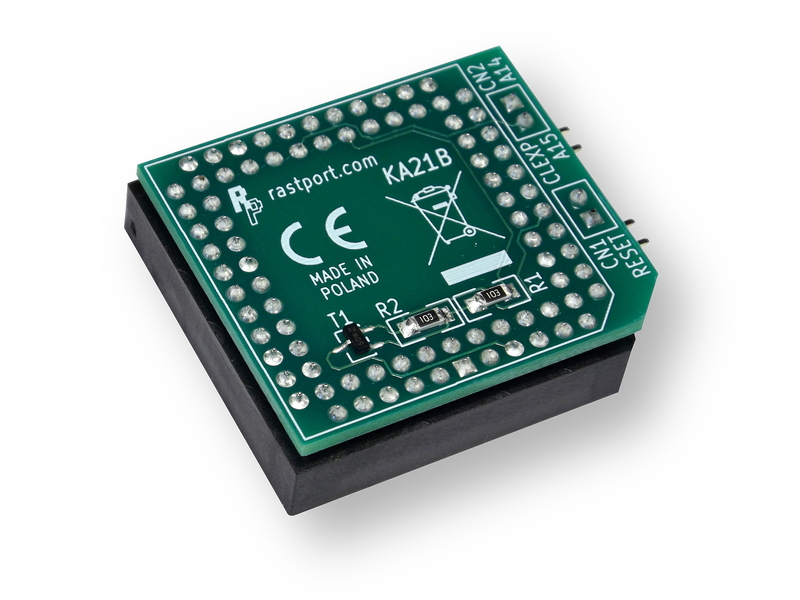 NOTE: If you intend to connect reset button using KA21 pins, connect the cable now. Later, the quartz generator (metal rectangle item on the right of Gayle) will make it difficult. Step 5: This step should be done in standing position. Put both thumbs at the center of KA21. Then press it down with one strong push. A click sound should be heard when socket contacts latch on Gayle pins. 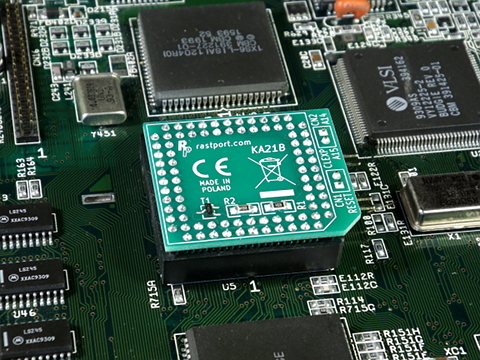 Step 6: When KA21 is properly installed, there is even 0.7 mm gap between the socket and the mainboard. One should be able to pick the mainboard up, using installed KA21 as a handle. KA21 may be dismounted with some thin, stiff, but not sharp tool, like butter knife or small flat screwdriver. 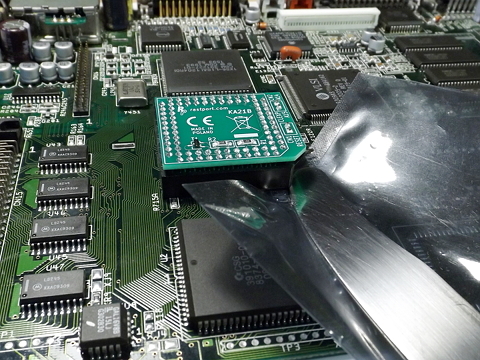 Put some paper (or ESD bag, like on the photo) under the tool, to avoid mainboard scratching. 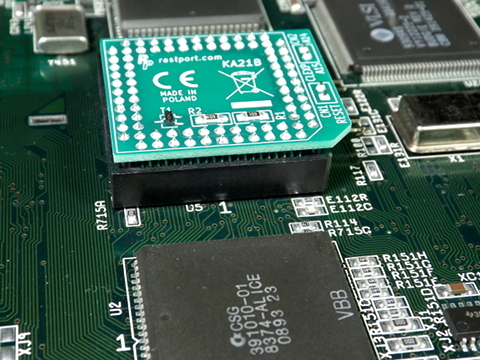 Then insert the tool edge into the gap between KA21 socket and the mainboard. Pry up the socket on a corner. Then carefully remove KA21 by hand, pulling it up. Do not use excessive force, pry up the opposite corner if needed.